Egypt’s President Abdel Fattah al-Sisi witnessed on Thursday the signing of a security cooperation agreement with Spain during his visit to Madrid. Sisi arrived in Madrid late Wednesday, after a short stop at the Cypriot capital of Nicosia. The agreement, which regulates cooperation between the two states in the field of security and combating crime, was signed by the Egyptian foreign minister and the Spanish interior minister, reported state television, citing the state agency MENA. Sisi also witnessed the signing of three memoranda of understanding with Spain; one in the field of intellectual property rights, another in the field of tourism and a third memorandum in the fields of transport and infrastructure, reported MENA. Sisi had earlier met with Spain’s economic minister and a group of managers of Spanish companies. The meeting was also attended by the head of the Spanish Chamber of Commerce, and the president of the Spanish Business Council, as well as a delegation of Egyptian ministers who accompanied Sisi on his trip. The president also met Spanish King Felipe VI and Prime Minister Mariano Rajoy. 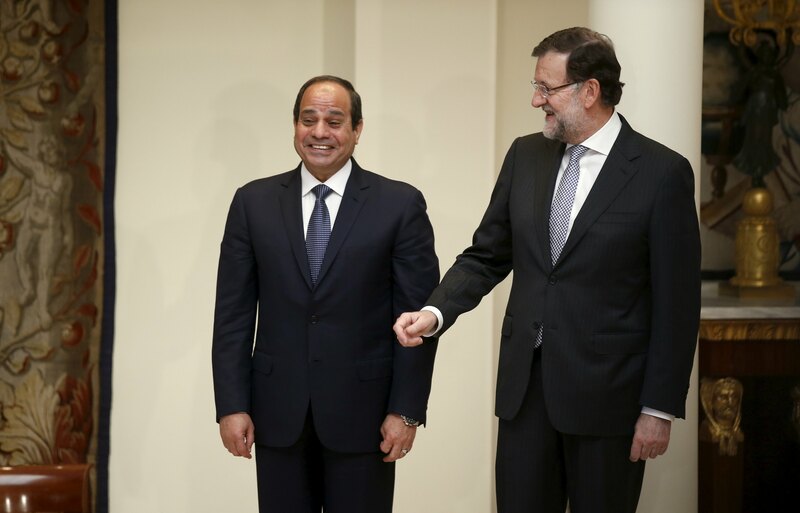 Sisi’s visit aims to strengthen bilateral ties with Spain, presidential spokesman Alaa Youssef had earlier said. He added that Spanish investment in Egypt has exceeded 700 million Euros in the fields of gas, cement and railroads.